When we were designing this collection it was originally going to start as a standard cutwork collection. 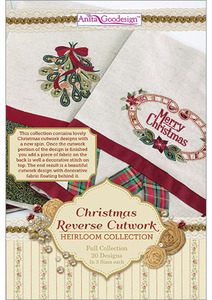 Since we already have a Christmas Cutwork collection we decided to add something different. Once the cutwork portion of the design is finished we add a piece of fabric on the back as well a decorative stitch on top. The end result is a beautiful cutwork design with decorative fabric floating behind it. The designs are truly gorgeous when they are stitched out. For our project we embroidered the designs on simple tea towels. Designs are for the 5”x 5”, 6”x 10”, and 8”x 12” hoops.